I knew eventually the time would come but it was still a little unsettling watching her pack up her belongings to begin this new adventure in her life. Even though I knew it was inevitable, a bunch of different emotions ran through me. Sadness. A sense of freedom. I am pretty sure those emotions were running through her too. Change is always a little hard even if you say you want that change. Time moves forward - sometimes too quicky. Is she excited? Scared? I wouldn’t blame her for either feeling . Did I do enough to help prepare her? Am a wrong or a terrible person to feel a little - relief? How did someone get so many clothes in so little time? Oh, I know I added to it on birthdays and Christmas but I still shake my head. How was all of this going to fit in the smaller closet in her new room? “Are you sure you need this?” I would ask, reminding her that she didn’t need to take everything right then. I wasn’t going to throw belongings left behind out in the street. “Oh yes” she assured me as I loaded it into the near-full van. Books, tv, clothes, shoes, bedding and even a few small stuffed animals to sit on her new bed and to give her comfort in her new surroundings. A little melancholy smile slipped out as I helped her load her cd’s and her boom box. We are two such different people, such different personalities. We are from different generations and yet we both have Clay Aiken cds in our collection. Do we like him for the same reasons? Hard to tell but something about his voice apparently makes us both want to listen. Oh, I know it is against some unwritten rule for parents/children to like the same singer but it doesn’t seem to be that uncommon when you look at fans of Clay. I think that is pretty neat, even if deemed not “cool” by those who resist finding some common ground at all costs. I wasn’t sure how it was going to go, this actual move. I figured I would be ok if she was. I knew there would be some initial apprehension and some period of adjustment. Getting settled and making her space her “own” will take some time. I know I will have to adjust to not having her here even though I know it really was about time for both of us and even more importantly for our relationship. It will be different now but that is probably for the best. We need a different view of each other. Maybe now, our relationship can be more about choice. Reaching a decision of this magnitude wasn’t easy of course. A lot of thought went into finding just the right spot. A place where her personality will be given a chance to shine and where she can be active and social. We talked about it quite a bit of course and I listened to what she had to say about where she wanted to be. She really isn’t too far away - certainly not such a distance where we will forget about each other. I worry a little of course but everyone seems friendly and inviting. I know that this will be a good fit for her. She loves people and will make new friends quickly. That helps ease some of my apprehension. The social opportunities are plenty and even if shy at the beginning, I know she will come into her own and have something of herself to add before too long. It is time for me to go. Will there be tears? Does she know I love her and always will? You think that it is a given but when you get to the point where you are leaving someone, you wonder. Did I say it enough? Will she remember? This isn’t the end by any means. Our relationship has changed before and this is just another chapter in her daily journal. I know that when I listen to Clay cd’s, our common bond will be there and I will smile. Maybe we’ll be lucky and we can go to a concert together. I hug her tightly. Call me if you need me. Goodbye for now Mom. I love you. I would imagine it happens to most of us. It may seem weird but somewhere, some day, you hear a voice that you recognize not so much with your brain, but with your heart. It can be the voice of a man (or woman) you end up loving. I had an old boyfriend who I thought I loved at the time. I was certainly infatuated. I spent a lot of time thinking about him and dreaming about him - and us - but when he called me on the phone, it always took a half a second to recognize his voice. Usually he would say “Hi, this is David” and my brain would finally register and I would think “oh” to myself. Then I met a guy named Mark. Through a weird twist of fate our first and second dates were 11 months apart and we didn’t talk in between. When he finally called me, I knew instantly who it was. No, he didn’t have some speech defect that made his voice unique or anything. My brain didn’t need to process it, I just knew. I really think it was my heart responding to his voice and it has continued to do so through the past twenty years. Your heart may recognize the voice of your child. My son was born 7 weeks prematurely. He was in the delivery room for what it seemed like a nano-second. They showed him to me (but without my glasses they could have told me he was a girl and I would have believed them!!) and he cried for a brief moment before they whisked him away to the neo-natal unit. I had developed HELLPs and was so sick myself so I wasn’t even allowed to see him for 3 entire days. When I got better and they took me down the NICU, outside the double entry doors, my heart heard him cry. I knew it was my son crying even though there were quite a few babies in the unit. I had only heard him once and for the briefest of moments but I had no doubt. My heart knew that particular tiny voice. It can happen with a singer. My heart recognizes Clay Aiken’s voice. Don’t get me wrong. I love lots of music and singers. I always have. Contrary to how some people would like to portray all of Clay’s fans, I DO listen to Top 40 radio, as well as classic rock and some other stations. I think this is partly how I came to the conclusion that my heart, not my brain, responds to something in Clay’s voice. I try to be logical about it but it is hard because I can’t deny that if I hear Clay’s voice singing anything I know it instantly - almost too fast for my brain to process what I am hearing. If my brain isn’t processing it, then what is? It seems like with almost everyone else, I find myself thinking about it. I hear a song and I usually process what the song is before I process who is doing the singing. For example, I hear the words to a particular song and then my brain that processes that it is a certain singer's song. It takes me a moment to place the voice. It is like my “oh” moment with the former boyfriend. It isn’t that I don’t like the voice or the song but it just takes a moment for it to sink in. It is more than just recognizing a voice though. Of course there are unique voices I can place immediately but then it is usually more of an afterthought. I will always recognize Steve Perry’s voice or Amy Lee's but it is my reaction to Clay’s voice that makes me believe my heart is involved. I can be somewhere crowded and it can be only background music but if a Clay song comes on, my attention is immediately focused. I recognize the voice before the song - before any other conscious thought. Funny thing, it happened to me again the other day. A Clay song came on and all of a sudden I was hyper-aware and my heart beat a tad faster. It’s been 4 years since I first heard Clay sing a note and I still react the same way when I hear his voice at the beginning of a song. As much as I have enjoyed many singers, that particular reaction is a first. I can’t help it. It is hard to hide it. The great thing about a heart is that it is individual and your own. My heart may not have recognized my old boyfriend’s voice but someone else’s probably did. Same goes for music. A voice that may not register with me may be making another heart skip a beat. Pretty neat if you ask me. Have you listened with your heart lately? And I think he was right. Lord knows he never did. 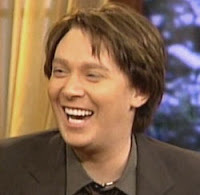 Throughout the course of my intrepid adventures as a proud member of the Clay Aiken fandom over the past four years, I have met a lot of fascinating, funny, vital, and yes…engaging and interesting women of all ages, from 15 to 85. Indeed, the reason I’m here posting on the internet -- and this blog in particular -– is because of some wonderful fans I first came to know online, and then, to my great good fortune, in person. So many generous, smart, compassionate people whom I would never have known if Clay hadn’t decided to camp out in that American Idol audition line in Atlanta four-and-a-half years ago. What is it about Clay that attracted such a scintillating group? Well, I suppose I could put it down to simple good taste, but it seems to be more than that. We were, and are, drawn to a great, unique, once-in-a-lifetime talent, but also a good and decent person who clearly has made it a priority to make a positive difference in the world. Someone who inspires others to do likewise. I can’t, of course, speak for everyone, but I know he touched something in me that made me want to be a better person. And I know I’m not alone in that…it seems to be one of unifying qualities about Clay upon which many seem to agree. Something a vast number of us have in common. Which is not to say that we’re all alike. Oh, no! Far from it, despite the media’s penchant for lumping us together into a big amorphous blob of “crazy Claymates.” We’re quite a diverse group actually, coming from all different kinds of backgrounds, and certainly don’t agree on everything -- or anything, at times. Everyone, it seems, has a different idea of what Clay should do next, what kind of music he should sing, where he should tour, what kind of tour it should be, what should be on his next album, even how he should wear his hair and whether his new teeth are flattering (I say yes, not that Clay has asked me for my opinion!). But amidst the all the good natured argument and extrapolation, you can feel the unwavering support -- not just of Clay, but of each other, too. I’ve never really been a fan of anyone before, or followed anyone’s career this closely (well, not since I was 13 and had 28 posters of Bobby Sherman taped to my pink bedroom wall). If anyone had told me that at this point in my life, I’d be traveling to multiple concerts in far flung cities, sharing hotel rooms with people I didn’t know well (needless to say, I do now! ), haunting Ticketmaster and broker sites in a quest for the best seats, standing in bus lines, and participating in other fan-related activities (I have a vague and somewhat embarrassing memory of balancing on a dumpster at a chain link fence next to a venue in Vegas with some other fans whom I met there), I’d have told them to get some professional help. And I couldn’t have imagined that I would find myself huddled for hours on a blustery street corner in downtown Chicago in the subzero predawn cold, just to get a quick handshake and an autograph on my copy of Learning to Sing. Nor would I have believed it if someone had told me I’d be agreeing to buy upgrades of tickets I already had, sight unseen, to a concert in Indiana from a fan I’ve never met over the phone from Vancouver while standing in a rest stop alongside a cornfield on I-67, enroute to the concert. But that, believe it or not, is a fairly typical experience for an internet Clay fan. And many of us have discovered creative and technical abilities we never suspected we possessed, and learned a few new skills. We’ve learned how to take excellent photographs and video, make montages, wallpapers, DVDs, CDs. Some have been inspired to write poetry and skits and songs and articles and fiction. As for me…I always knew I could write, but I never had any idea I would be good at writing comedy, much less putting it out there for public consumption! And I certainly had no clue that I would enjoy it so much. Am I grateful to have had the opportunity to do these things? You bet. Do I regret any of the time and effort and money I’ve spent? Hell, no. Is my life better because of the knowledge that you can always count on a Steak 'n' Shake to be open at two in the morning on your way back from a concert when you're jonesing for a chocolate shake? No question. Do I feel younger than I ever have? Absolutely. 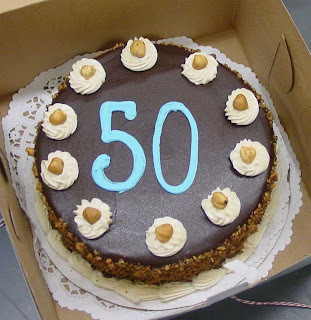 For those of you out there who have yet to reach this milestone, I can tell you that I am living proof that the popular adage is true: “50 is the new 30.” And Clay, pretty much…it’s all your fault. And in the Dead of Winter, Baseball beckons. I love that statement. I have my Red Sox Nation card in my wallet right next to my Clay Nation fanclub card. The Red Sox are in Spring Training right now, getting ready for a new season with some old players and some new players. And one Jason Varitek with thighs of steel. I love Varitek. In addition to being very good at his catching job, he's smooth when talking to the press and he also has a great sense of humor. He recently told newly acquired Japanese pitcher Daisuke Matsuzaka that it is an American tradition for the pitcher to carry the catcher's gear on the field. He finally had to tell him through a translator that he was just kidding. He eats applesauce between innings and anyone who knows me knows I love applesauce. MrNan does too. His eating habits are like mine and my husband's are more like Nan's. We may have married the wrong men. How did she end up with the Clay fan? And in the Dead of Winter, Clay beckons.....with a summer tour. 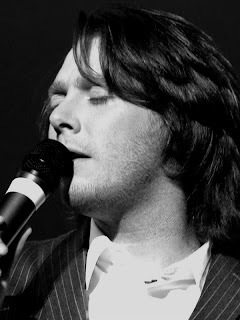 Clay Aiken's fanclub announced today that he will be releasing information about a summer tour in a few days. Good thing I gave up that raise for an extra week's vacation. 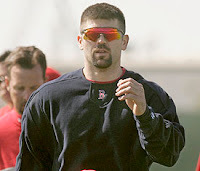 I'd like to think Clay's going to have some old players and some new players too.Clay is a lot like Varitek. He's very good at his job, he is smooth when talking to the media or being on TV and he has an even snarkier sense of humor. He can't throw though. Varitek has a rifle. That's OK, I've seen enough pictures and video to tell me that Clay has a.....sword. Varitek doesn't take any crap as evidenced here and neither does Clay as evidenced by his request to give a finger....er a hand....to the tabloids and gossip bloggers in his last fanclub blog. There is something about the roar of a crowd all cheering for the same thing. Whether it is the slow roar as everyone stands to watch a late inning comeback home run from David Ortiz arc its way into the visitor's bullpen or the all at once roar that happens as Clay makes a grand entrance from the back of the venue or from underneath a rising staircase, you feel a part of something grand. When Clay tours, the excitement in the crowd is palpable. This tour promises across the US so many who haven't been able to see Clay in a pop concert will get to feel the hair rise on the back of their neck as the anticipation swells over the crowd like a wave. I can't describe it and I've seen many other artists in concert. My brain goes into a different place. It's like a revival And no two concerts are alike, thanks to his gift of improv-like comedy. I've been a Red Sox fan for as long as I can remember. It's part of who I am. I cried long distance tears over the phone with my Dad when they finally won the World Series. When they were down 3 games to the Yankees, there were signs all over New England that said BELIEVE. I feel the same way about what 2007 has in store for Clay. I believe. He'll feed his soul this month and next with his charity work and then he'll begin the fresh start he spoke of in his New Year's message. The Red Sox will do the same. I do believe a Fenway Frank may cost more than a Clay Aiken ticket since they keep picking up so many expensive players. And now..nooow.....nowww..noowww, playing left field..field..field....Andy Abad. I hope to travel to other parts of the country this year to see Clay's summer tour. You see, I need to see my other family. My Clay Nation family. Despite our differences, we all come together to celebrate the man and his voice. Even he noted it, in this September interview. It's hard to explain. I found a clip from the baseball movie Fever Pitch where Jimmy Fallon's character tries to explain it to Drew Barrymore. The last line says it all. I wonder if he likes applesauce.